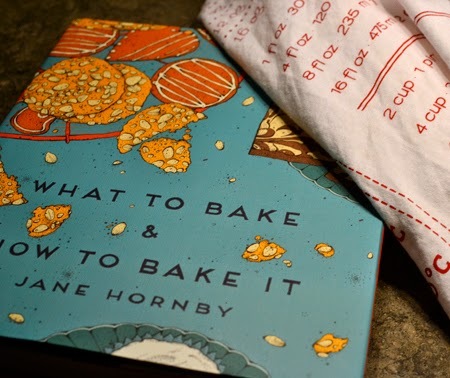 Phaidon Press recently sent me a review copy of What to Bake & How to Bake It by Jane Hornby. The large, beautifully-illustrated book arrived a couple of weeks ago, giving me ample time get to know the book and try a few recipes. 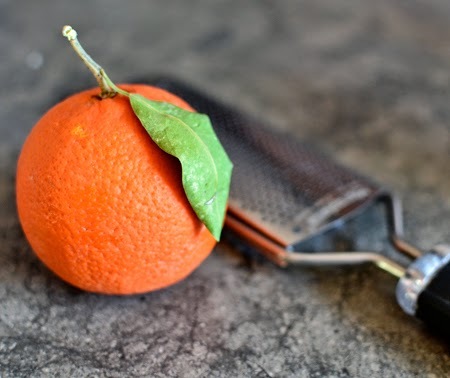 When reviewing a cookbook, I start with a quick overview. Is the index easy to use? Does it have the sections I usually look for? Is it engaging both to my eye and my taste buds? Are the recipes interesting? Will I want to look at it again, as soon as I get home from work tomorrow? Granted, these are basic questions, but they are the questions that matter. The most telltale question is the last one; did I return to it as soon as I got home from work? Yes!. And, as our friends Susan and Appy were due for dinner the next evening, it was the perfect excuse for me to make something to give the book a trial run. Going back to my list of questions, I found the book to be set up well, starting with my favorite [among all cookbook introductions? Or favorite chapter in this cookbook?] introductory section. Hornby gives basic advice for successful baking: how to master cakes, pastries, cookies, and bread; lists of required equipment and best ingredients; and a photographic guide to baking sheets, pans, utensils, equipment; and - my favorite - the visual guide to what things should look like. The visual guide includes what poorly-creamed butter, split batter, overbeaten egg whites, overwhipped cream, and burnt melted chocolate look like. Equally important, it shows what they should look like. For a novice, this is invaluable. Heck, it helps all of us! After the introduction, the book is divided into four sections comprising the 50 recipes in the book: Simple Family Baking; Morning Coffee & Afternoon Tea; Special Bakes; and Desserts and After Dinner. While I can't figure why scones appear in both Family Baking and Morning Coffee, or why pumpkin pie is a Special Bake and not under Desserts and After Dinner, I did decide that these choices are personal. The important thing is that they are easily found, well done, gorgeous to look at, and the instructions are detailed and accurate. 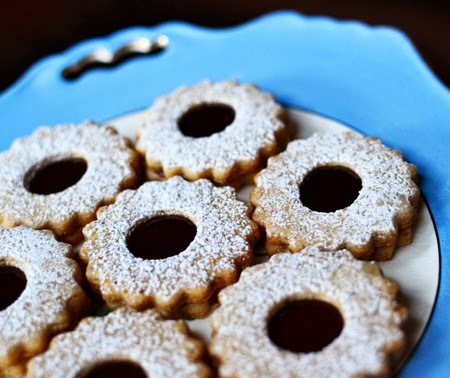 For our guests, I chose something from Special Bakes section, something I hadn't had in ages - Linzer Cookies. Hornby makes hers with hazelnuts but acknowledges that some people prefer almonds. 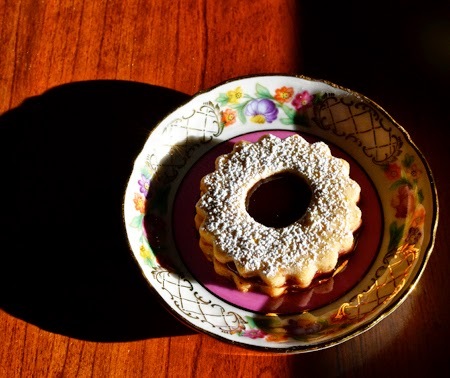 As I had my first Linzer Cookies in Germany, made with almonds, that was my choice for the cookies, too. 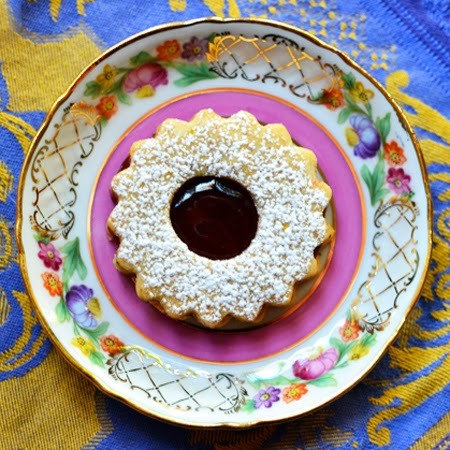 Hornby's incredible attention to detail made the recipe a breeze for me, and the results were, without doubt, the best Linzer Cookies I have ever had. Since then, I have made her buttermilk pound cake. Again, it came out perfectly. She used a hand-held mixer, but said it could easily be made with a stand mixer. For the test, I used my hand mixer, as well and it came out looking just like the photo in the book. Cake taste-testers Barb, Maura, and Leigh all loved it. I served it with lemon curd, a popular condiment here in citrus world. Some of the other recipes I plan to bake soone include: Golden Drizzle Citrus Cake, Vanilla Sponge Cake, Classic Crusty Bread, Cherry-Almond Streusel Slice, Maple-Pecan Cinnamon Rolls, Coconut Layer Cake, Chocolate Hazelnut Log, Strawberry Meringue Cake, and Mint Chocolate Macarons. I like this book a lot, and happily recommend it. As you can tell, the recipes cover a range from simplest to fancy, and all are completely doable. Hornby's clear directions - with her beautifully laid out visual instructions - will make this a go-to for all bakers. Preheat the oven to 350°F. Lightly grease 2 baking sheets with butter, then line them with parchment paper. (I opted to use my Silpat liners, so did not grease the pans.) 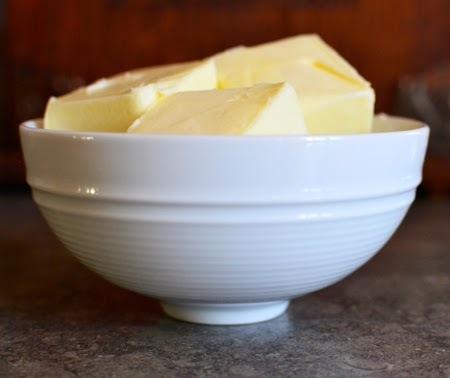 Separate the egg, then put yolk in the bowl of a food processor with the sugar, the vanilla, and butter. Process the ingredients together until creamy and evenly mixed. Add flour, salt, cinnamon, and ground nuts (almond meal) to the processor bowl. 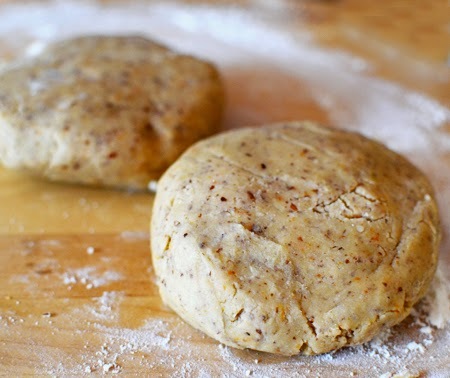 Finely grate the orange zest, if using, then pulse until the ingredients form a soft dough ball. 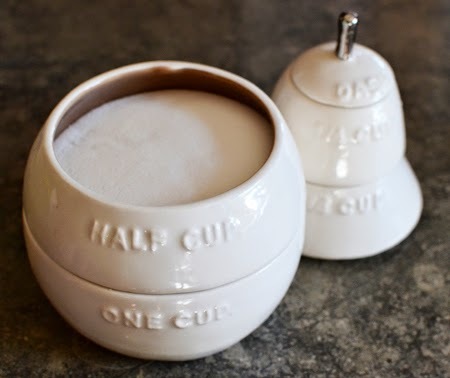 You may need to scrape the sides of the bowl down once or twice. Lightly dust a work surface with flour, turn out the dough onto it, then split it into 2 equal balls. Flatten each ball into a saucer-size disk. Wrap in plastic wrap and chill for 20-30 minutes, or until firm but not rock solid. 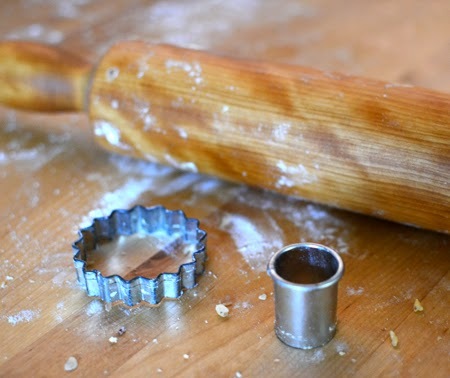 Sprinkle more flour on the work surface, then get ready to roll. Press ridges into one of the disks of dough with a rolling pin (this stretches it without overworking it, which makes it tough). Turn the dough and repeat this ridging a few times, until it is about 3/4-inch thick. If any cracks appear, pinch them together. Now roll the dough to about 1/8-inch thick. 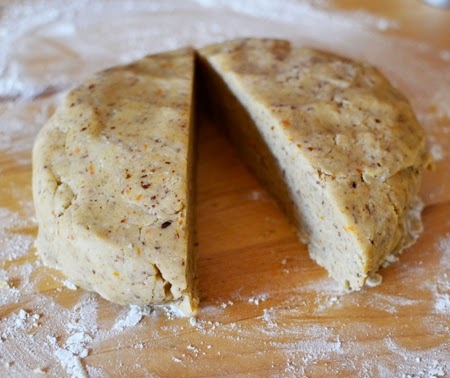 The dough is very short and may split; don't worry - just gently press it back together. Using a 2 /12inch fluted pastry cutter, stamp out 12 rounds. Next, using a small heart or star-shape cutter (Or even the end of a wide icing tube to make a round hole – I used a 3/4-inch round cutter), cut out shapes from the centers of half the cookies. Bake the whole cookies for 10-11 minutes (I baked mine for 11 minutes) and the cut-out cookies for 9 minutes, or until they are pale golden and smell nutty. 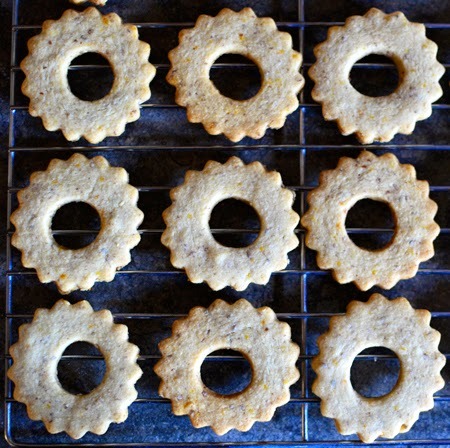 Let stand for 2 minutes, then lift them onto cooling racks and let cool completely. Repeat with the second batch of dough. Jill - I will remember to send an invitation next time! I'm with Jill, when do we get to taste!? Seriously, looks like a great book... great review too, David. 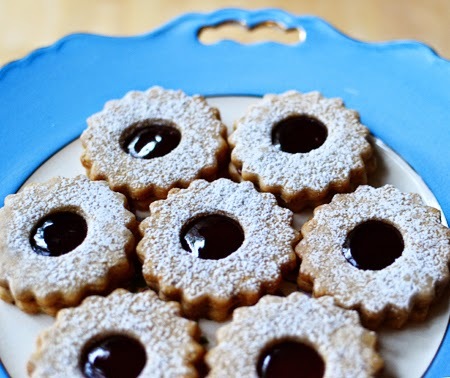 And Linzer cookies, I've always wanted to bake those! Thanks, Liz - I think you will really like these! I'm so glad that you featured this recipe - I've wanted to try these for so long. 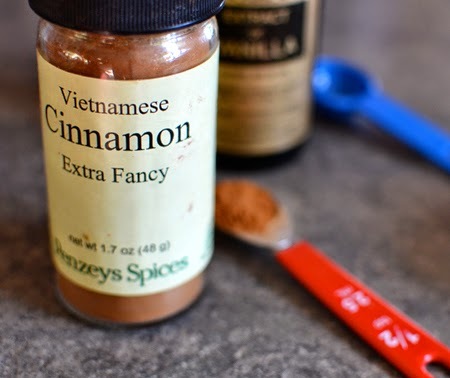 Isn't Penzeys Cinnamon the best? I agree with your criteria for a cookbook review but have never articulated it this way. I just received the most hilarious book to review called "Confessions of a Serial Entertainer" by Steven Stolman. I did find a couple of recipes to try - but a lot of them use Bisquick, etc. Anyway, if you're offered it, I think you'd really enjoy his writing. I love Penzeys, Susan - it is so wonderful to have a store only a couple of minutes from the house - convenient and dangerous! Thanks for the recommendation of "Serial Entertainer!" David, ah Linzer Kekse - actually they are some of my favorite cookies to bake at Christmas time and I also add lots of nuts, cinnamon and vanilla and my favorite jam (seedless as well) to them - you certainly baked some picture perfect cookies there - I bet they were an absoulte hit and disappeared in no time! Vielen Dank, Andrea! 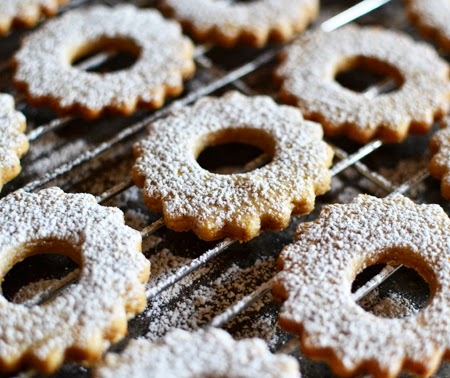 Do you use almonds or hazelnuts when making Linzer Kekse or Linzertorte? Wow - that is the greatest compliment I could get! I love your site - I went over and read lots trying to find your name to thank you! Padaek is lovely and I look for3ward to your posts! Valentina - so glad you liked the powdered sugar shot. It was just too much fun to pass up! David, I believe Linzer cookies travel well by mail...just sayin. 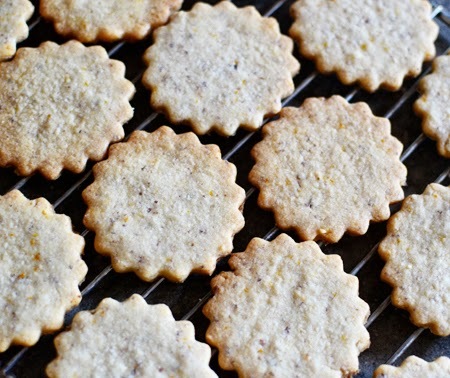 I love, love Linzers and yours look fabulous! 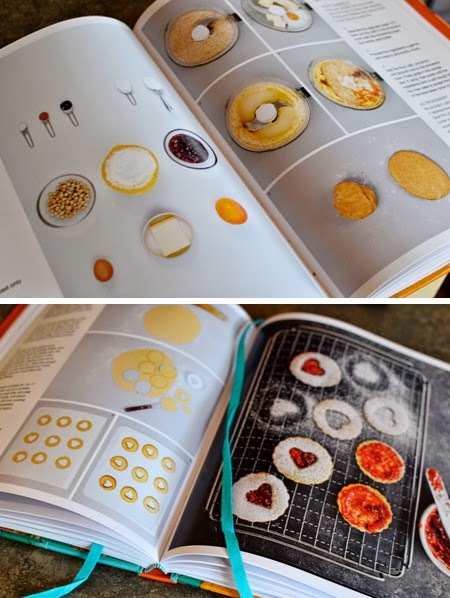 I love cookbooks with lots of photos, because I want to see what it looks like! I've never understood the books without photos or maybe just a couple here and there. I would think photos are vital for a cookbook! Ah, the scones appeared in both places, Nazneen - which is why I was so confused! But, really, it doesn't matter as there was a scone there, too. David, That's quite an endorsement! It looks like a book I would like to have in my library--I love the idea of a section that shows what something should and shouldn't look like. Now, when are you writing your own? Susan - I agree! The section that shows you what things should and should not look like is extremely valuable! 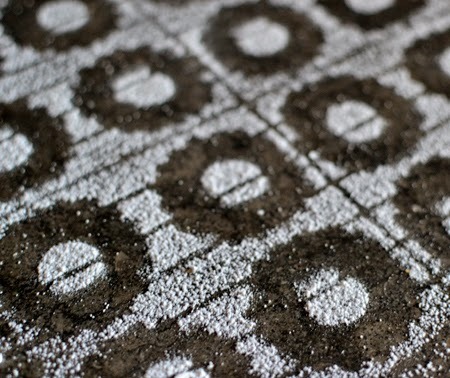 Your linzer cookies look beautiful. The book sounds like it would make a great gift to give to new bakers, with all its photos of what things should look and not look like. You are right! And I think this would make a great wedding gift, Karen.